From Jules Verne to the Little Prince, and from Georges Méliès to Neil Armstrong, the Moon embodies all the dreams and challenges of humankind. And for its first contribution to Only Watch, Louis Moinet has reached across 250,000 miles to our lunar satellite, so as to offer children a brighter future. "We thought long and hard about how best to reach for the Moon and help children suffering from myopathy,” explains Jean-Marie Schaller, Ateliers Louis Moinet’s CEO and Creative Director. 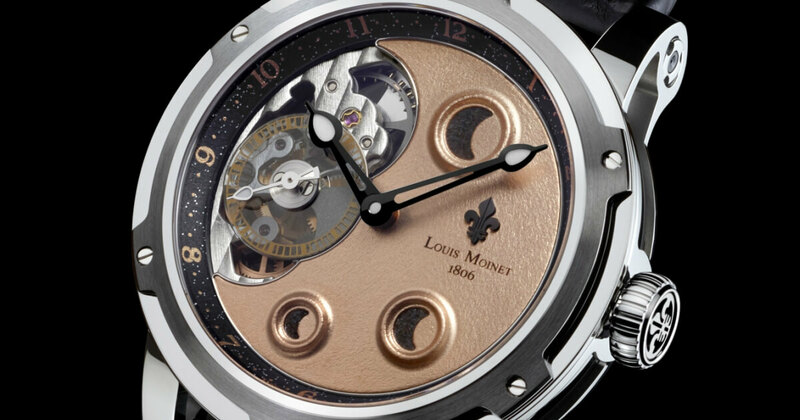 “The legacy left by Mr Louis Moinet himself helped guide us in the creation of this timepiece. As a watchmaker, he was one of the pioneers of observational astronomy. This piece demonstrates our commitment to Only Watch – and also offers a fitting tribute to an outstanding inventor and committed humanist." For its first contribution to the Only Watch charity auction, Ateliers Louis Moinet has summoned the very essence of its knowhow. The firm has produced a unique timepiece, “Metropolis for Only Watch” – a most worthy successor to Mr Louis Moinet’s own Compteur de Tierces from 1816, the first chronograph in history, which was also used for observational astronomy. Louis Moinet's "Only Watch" offers an artistic vision of our nearest neighbour. The moon's illuminated face is portrayed on the dial. Its hidden, dark side features on the rear of the watch, on the rotor. The piece sports a gold-plated dial, for which the firm has performed another first in terms of decoration: its face is first gilded – and then hand-punched to form lunar ‘craters’. And to complete the metaphor, Ateliers Louis Moinet has filled these craters with genuine fragments of lunar meteorites. By combining both its artisanal skill with dials and its expertise in the craftsmanship of stones and meteorites – now one of the firm’s hallmarks – Ateliers Louis Moinet has produced a uniquely beautiful sidereal work featuring amazing miniature painting. This dial is and will remain the only one of its kind in the world. Close to its edge, between 8 o’clock and 11 o’clock, Louis Moinet reveals the piece’s beating heart: an in-house movement, the LM31 caliber. Above the visible escapement, a small seconds hand glides over a sapphire crystal counter, slightly smoked to ensure it is perfectly readable. The hour hands are in blued steel, in the purest fine watchmaking tradition. 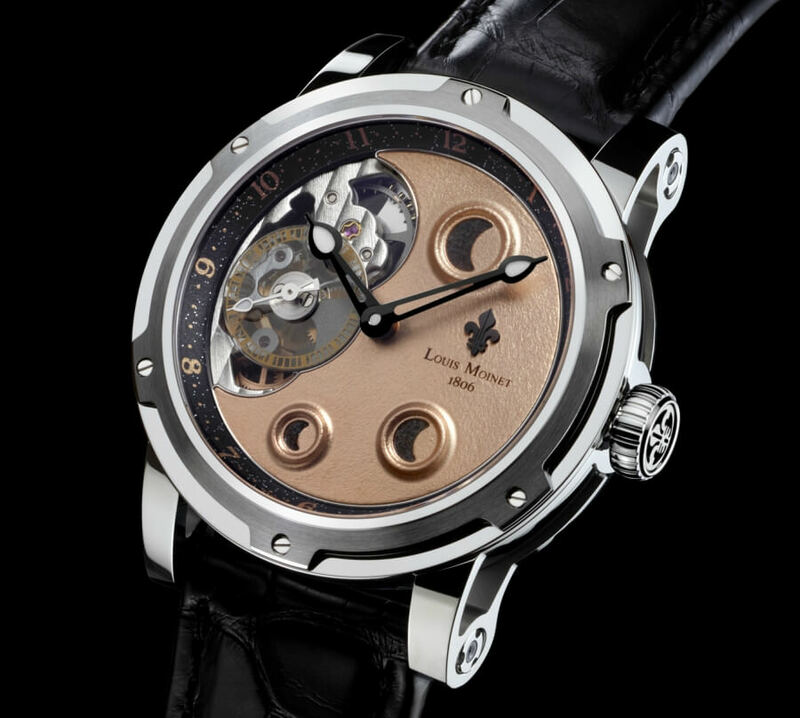 Featuring Louis Moinet’s signature “dewdrop” tips, they trace a circle around a powder-coated black flange. 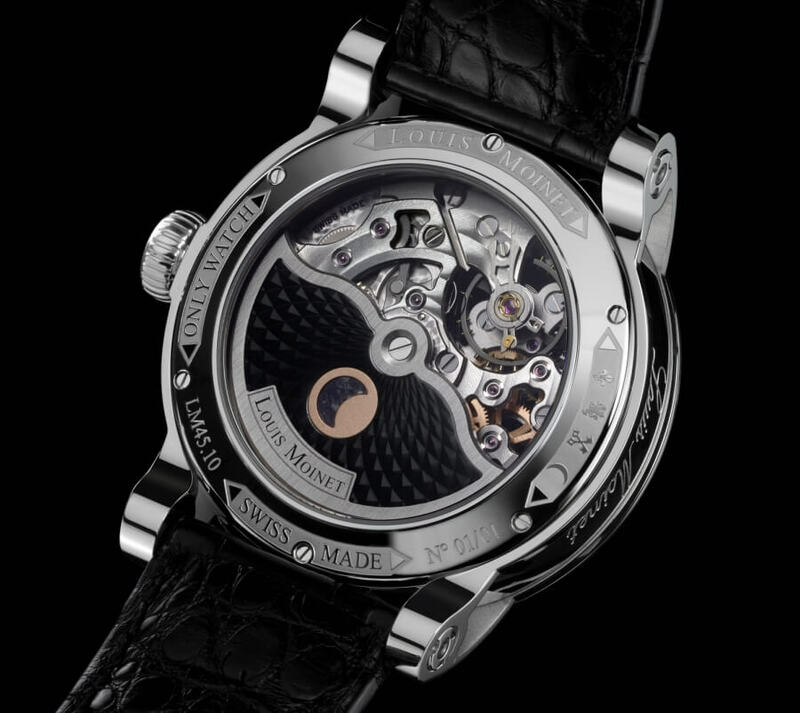 The 43.2 mm diameter steel case reveals the entire underside of the movement through a sapphire crystal caseback, around which the words “Pièce Unique – Only Watch 2017” are engraved. The watch is wound by means of an oscillating weight decorated with a concentric Clou de Paris pattern and a fragment of lunar meteorite – another finishings first for the Ateliers.